Beauty Everlasting: Drying Flowers . . . In a cool climate like New England, with a short growing season and so much to do, summers often feel as if they are passing by too quickly. It seems like we’re all scrambling to stretch out the warm months and the joys of outdoor living for as long as possible. We want to hold on to the sweetness of these long, luxurious summer days. Like many gardeners, my August weekends are filled with harvesting, cooking, baking, freezing, canning, dehydrating and otherwise preserving the fruits of my spring and summertime labors. There’s a feeling of overwhelming abundance. Over the past few days, I’ve been busy braiding and tying garlic and onions, sun drying mushrooms and tomatoes, cutting and bundling herbs, and gathering armloads of flowers for drying. Preserving flowers is one of the nicest ways to carry a bit of summertime into the cold, dark months of winter. And it’s such an easy process, that the only thing holding many gardeners back is simply the reminder, and time to do it. Right now, while deadheading and tidying up borders is on my mind, garden shears are often close at hand. Instead of tossing those seed pods and withering remnants into the compost heap, why not gather them up and bring them indoors to preserve for autumn and winter arrangements. And while you’re at it, remember to pick an extra bouquet or two of fresh flowers and herbs to hang from the rafters. Tried and True Method: Tying and Air-Drying Works Well for Many Flowers. Be Sure to Find a Dry, Warm, Dimly Lit Space with Good Air Circulation. 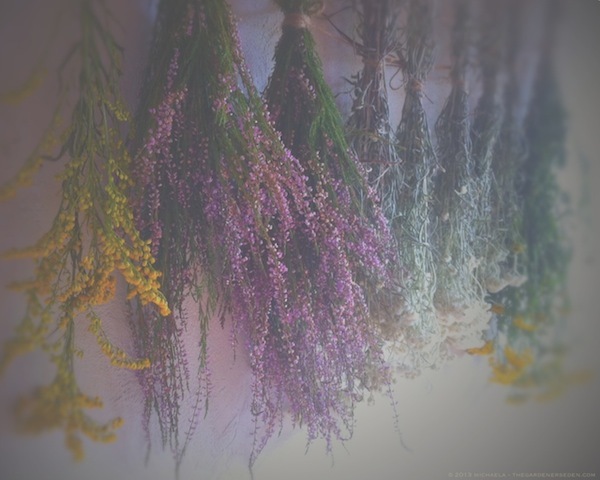 Attics, Closets, Dimly-Lit Spare Rooms and Pantries are All Very Good Spots for Drying Flowers and Herbs. The simplest method for preserving flowers and herbs is to air-dry them. Harvest once a week or so throughout the growing season —always on dry, sunny days— and hang them upside down in bundles, as shown above. Gather more than you think you need, as most flowers shrink down to about half their original volume as they dehydrate. 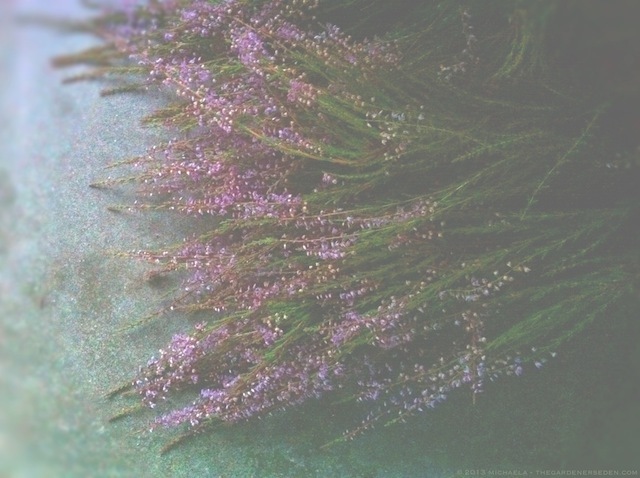 Remove excess foliage from stems (except in the case of aromatics, such as Lavender and Artemisia), and create small bundles of flowers, allowing for good air flow between the blossoms. Tie the stems with a bit of garden twine and hang them upside down, in a dimly lit, warm, dry space with good air circulation. Good spots for drying flowers and herbs include attics, pantries, spare bedrooms and closets. 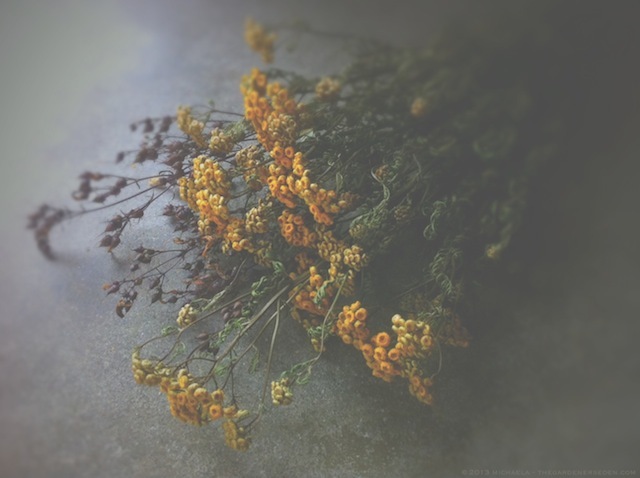 Dry basements will work too, but keep in mind that moisture and mold are the enemy of dried flowers and herbs. You may wish to cover the tops of delicate flowers, or aromatic cuttings with tied, brown paper bags to prevent damage and keep them free of dust. Bundles may be stored in this manner until they are ready to be used in arrangements (allow at least two to three weeks for flowers to completely dry). Some good herbs and flowers to try air-drying include; Straw Flower (Helichrysum bracteatum), Statice (Limonium sinuatum), Globe Amaranth (Gomphorena globosa), Love-in-a-Mist (Nigella damascena), Pearly Everlasting (Anaphalis margaritacea), Cockscombs (Celosia cristata), Baby’s Breath (Gypsophila), Goldenrod (Solidago), Globe Thistle (Echinops), Sea Holly (Eryngium), Heather (Calluna), Heath (Erica), Queen Anne’s Lace (Dacus carota), Yarrow (Achillea), Lavender (Lavendula), Tansy (Tanacetum), and Worm Wood (Artemisia). 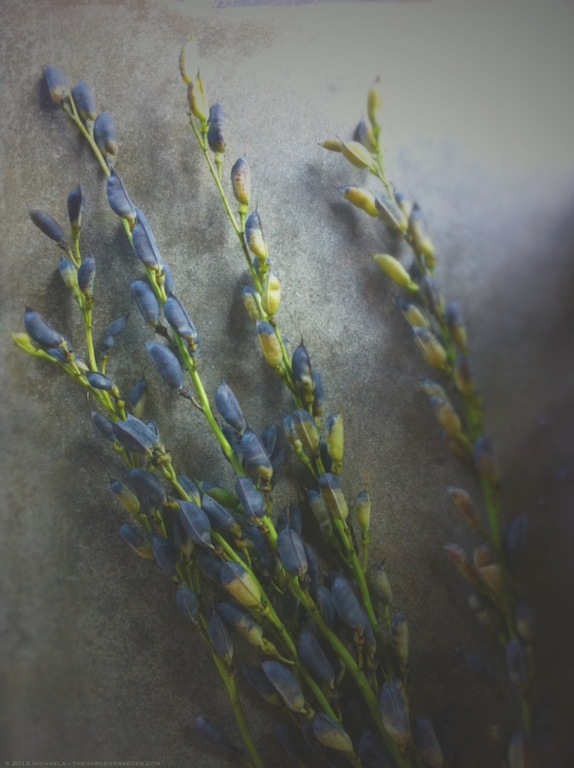 When experimenting with dried flowers, look for plants with rugged stems, stiff or papery petals and/or tiny, tightly-bunched flower heads. Many annual, perennial and woody garden plants —both edible and inedible— make excellent dried specimens. Look out for plants with interesting seed pods or berries, which add beautiful texture to a vase. Plants like Wild Blue Indigo (Baptisia australis), with gorgeous black seed pods, and Carolina Lupine (Thermopsis villosa), with its fuzzy remnants, are striking examples. And don’t forget to scour the forest, fields and shoreline for pinecones, wild grasses, driftwood, vines, seedpods, berries and other botanical remnants in the early days of autumn. All of these, and many more natural elements, make great additions to seasonal arrangements. Although many blossoms can be tied and dried hanging upside down, some flowers —such as Hydrangea, Larkspur (Delphinium) and Allium— preserve best when left standing up. I like to place these blooms in vases with just a small amount of water; allowing the flowers to dry as they absorb the moisture in the vessel. If you wish to preserve shape of flat-topped blossoms —Queen Anne’s Lace and Yarrow, for example— support the heavy flower heads by slipping the stems through wire screen and allow them to dry standing up. 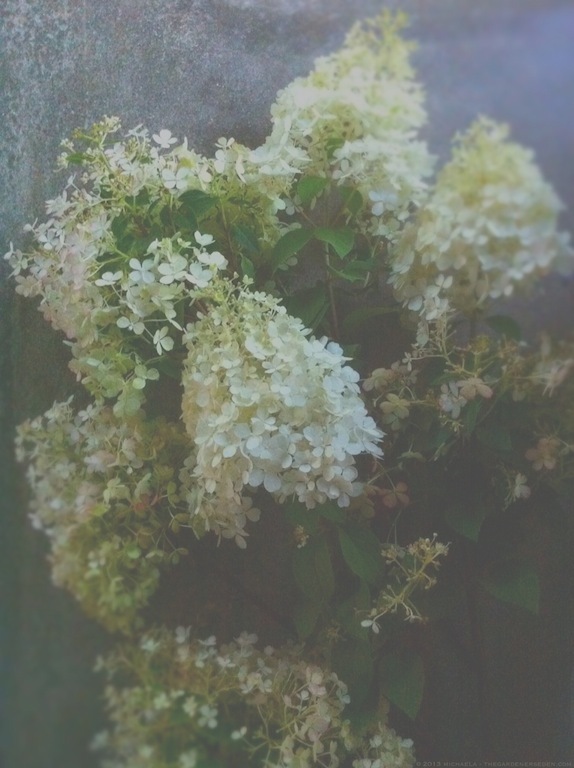 Hydrangea paniculata ‘Bobo’ is a New Addition to My Garden. I Can’t Wait to See How the Flowers Dry. Drying agents —including borax, cornmeal, sand, alum and silica gel— can be used to aid in dehydrating and preserving more delicate, difficult flowers. Peonies, Dahlias, Tulips and Roses turn out particularly well when dried in sand or silica gel. Some gardeners like to use microwave ovens to dry blossoms; filling paper cups or bowls halfway with silica gel, embedding flower heads, covering with more gel, and zapping them for a minute or two. 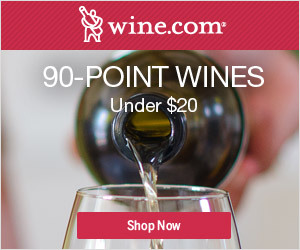 I haven’t tried this method myself but have seen good results. Flower petals and small bundles of flowers —particularly rose and peony blossoms— may also be dried flat and later displayed on platter arrangements or used in potpourri. Combining petals with preserved herbs and oils is a nice, traditional way to add the subtle scent of nature to closed rooms during long winter months. Ornamental grasses and ferns can also make beautiful additions to dried arrangements. With the exception of a few early ‘bloomers’, I harvest and dry most ornamental grasses in late summer and early autumn. After the inflorescences are completely open, I gather up large, arching grasses, rushes and sedges —Miscanthus, Panicum, Scirpus, etc— and arrange them in floor vases and urns. 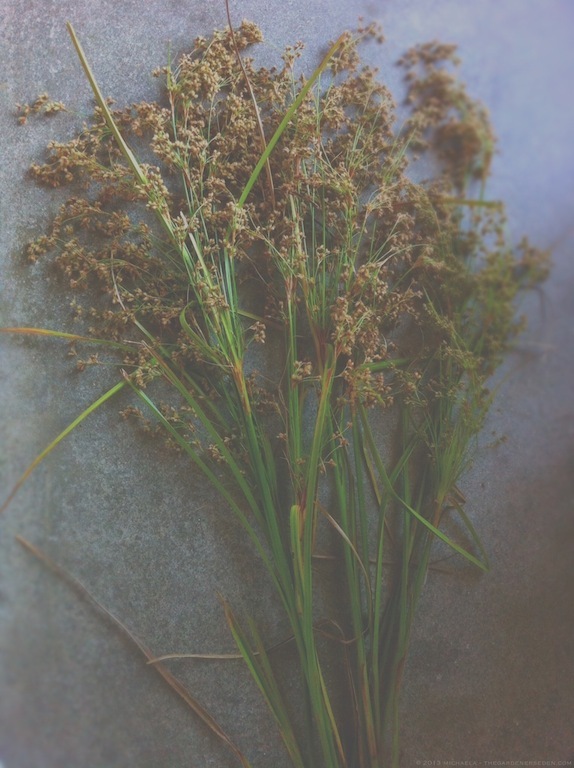 Shorter grasses can be tied and air-dried upside down with flowers and herbs. 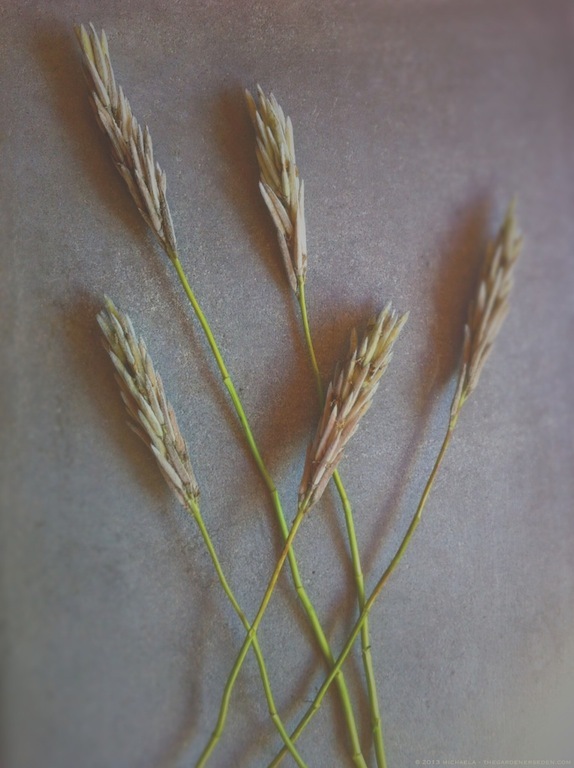 I also gather extra grasses and store them out of the way —in empty florists buckets— for use in wreaths and winter arrangements. Many ferns can be successfully dried as well. Christmas ferns (Polystichum acrostichoides) and Painted ferns (Athyrium nipponicum), dry particularly well when pressed, and combine beautifully with autumn leaves and flowers; both dried and freshly harvested. I’ll be writing more about preserving summer’s bounty in the coming weeks. 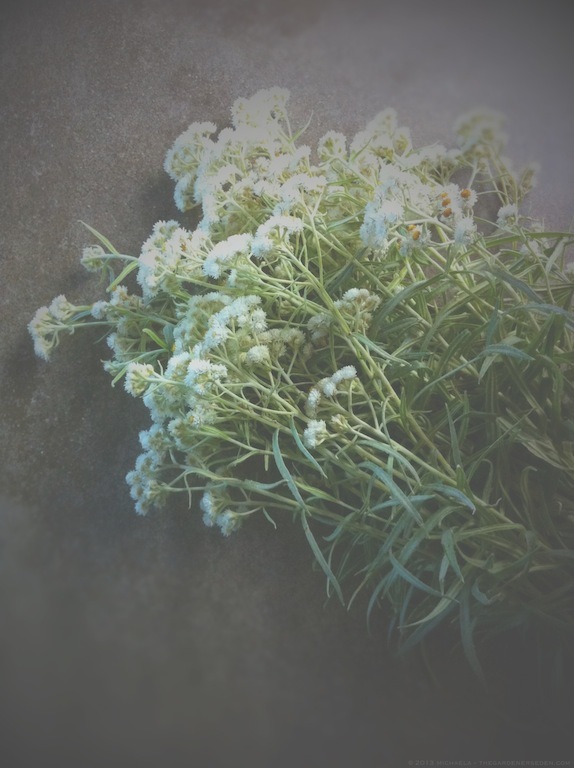 In meantime, feel free to share the names of your favorite dried flowers and/or preservation methods in comments here on the blog, or on this site’s Facebook page, here. 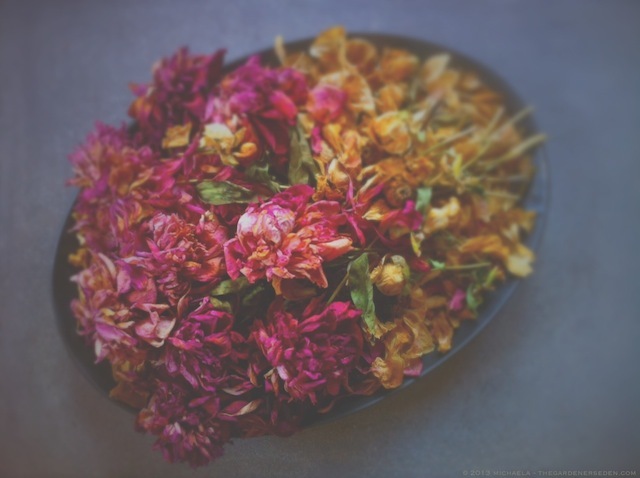 You are currently browsing entries tagged with DIY Dried Flowers at The Gardener's Eden.